Tonight on Habitat Podcast #28 – Jake Korngable – GAME PLAN – we cover the Flyer Buck, MI vs OHIO ST, Patience Strategy, Giving Your Property 100%, How Bad Do You Want It?, Cover, Food, Back to Feeding Stage, Hunting like Lee Lakosky, Big Ohio Bucks, Starting Young. 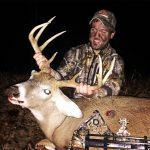 We cover much more, but get into details about how Jake hunts and consistently gets on big mature deer. Listen as we discuss his strategy and how you can get back on food this weekend as the rut winds down. Thanks for listening to the habitat podcast.